Open up Google and type in "Can I play cello if I...". The first thing that came up for me was "...am double jointed?" I'm no contortionist, but I do have mild hypermobility, to the delight of my Alexander Technique teacher and the other children at my elementary school. Also, I've taught many college students with joints that can stretch way farther than mine. In cello playing, this manifests in fingers that buckle on the string and the bow, joints that lock painfully, excess tension, and pain. What can a person with hypermobile finger joints do to make cello playing comfortable? 1. Well, you could just ignore it, but that's not an option if it hurts or if you seriously want to improve. 3. Wait to see if you grow out of it. I don't recommend this either -- why wait until a habit is so entrenched as to be unbreakable, and you start hurting yourself? 4. Find some exercises that encourage rounded finger shaping so that this becomes habit. I was excited to read this article by the violin teacher Lora Staples, where she encourages students to practice an exercise using a clothespin to build finger strength. Inspired, I found one in my laundry closet and tried it. But after a few repetitions, the tendons of my wrist started hurting, so I had to go to the grocery store to seek one that was more loosely sprung. Even that kind of hurt. I did want to keep doing the exercise, however, because I was looking for solutions for my undergraduates, so I started thinking of other household objects that might do the same amount of good without causing pain. The answer came to me while I was cleaning my bathroom -- the trigger of a spray bottle! I tried the exercise on that and it worked brilliantly. Much "softer" than a clothespin, but with the same good results. Here are some of the ways you can practice rounded finger shaping using a spray bottle. a) Locking, tense left thumb? 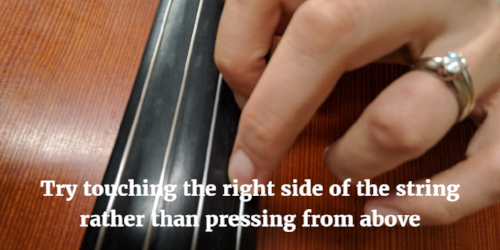 Avoid having the pad of the thumb press the cello neck. Look at how your fingers come together naturally -- your thumb comes in sideways. Let it do this on the neck too. b) Fingers buckle on the string (especially in thumb position) and you can't find a comfortable angle that enables rounded shaping? You can, especially at high speeds, play on the side of the string and still get a good sound. c) Fingers keep locking and causing pain? Try moving from finger to finger not by over-exercising the hand and fingers, but by thinking of the arm's weight as the agent that gets you from finger to finger-- like you're swinging from a bar at the gym. Keep your left thumb free (touching the neck with the side of the thumb helps with this, because you can't "press" so easily) so that it can move to "oppose" each of the fingers. Copyright Miranda Wilson, 2017. No part of this post may be reproduced without the author's permission.